Back at the end of last September, my wife pooled all of our close friends and family together to buy me Blu-ray trilogies. We decided that we would do one trilogy per month. I've done three of these posts so far ("LOTR", "Bourne", and "Oceans"). In those, I feel I tried to act like something I'm not. By that, I mean I actually tried to watch and review special features. The truth is: I don't really have time for that with all of these, I've found. I've decided to focus on what I love about these movies from here on out. How they connect to me, and, really, to all of us. Digging out themes is what I really love to do. I'm not doing consumer reviews here. I'm sharing a love of classic American cinematic trilogies. So, I'm not gonna really review the extras, I'll just list what's available, whether I get to watch them or not. If I get to watch them, as was totally necessary with LOTR, I will comment. For this one, let's get it out of the way now: the "Back to the Future: 25th Anniversary Trilogy" Blu-ray is beautiful. The movies looks great, they sound great, and there are hours upon hours of featurettes and makings-of and interviews and archive footages and commentaries, even a documentary about the physics of the films. I will watch some of this eventually. Last year, my wife met a guy in one of her classes at UT, who is writing a book about the geographical aspects and importance of this trilogy. Geographical? What's that all about? Recently re-watching this trilogy, I totally get it. No other movie is so closely grounded in the history and changing human and social geography of a small town over the course of such a long period of time. 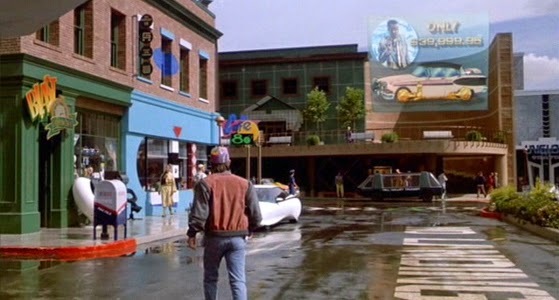 The town, of course, is the fictional city of Hill Valley, California. Throughout five distinct time periods, we come to know and love this town and its landmarks. The cafe, the clock tower, the housing developments, the town square. When you've seen this trilogy as many times as I have, you begin to see the connections that people, their hometowns, and their landmarks have to time. 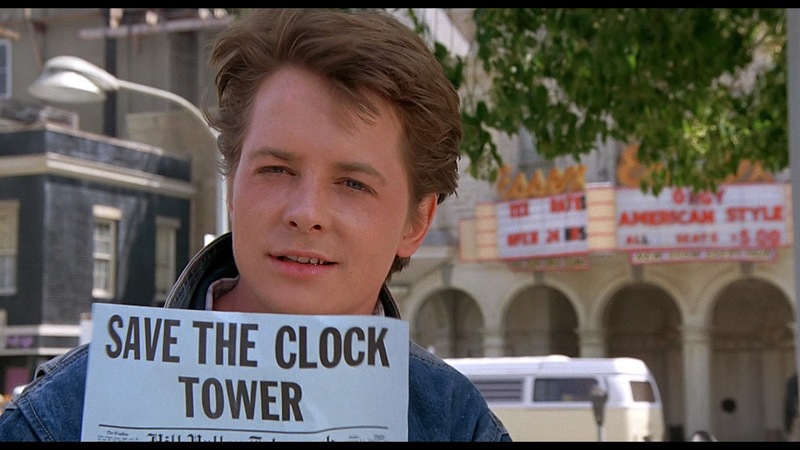 The most notable is obviously the idea of the Hill Valley Courthouse Clock Tower, and the desire to "save" it. 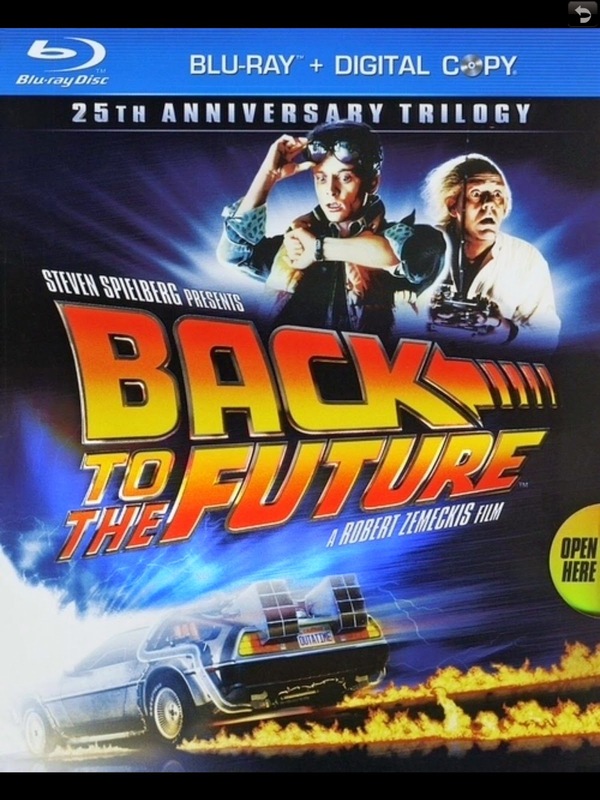 In the first installment, released Fourth of July Weekend, 1985, we meet Marty McFly, played by rising star Michael J. Fox, already established in the TV world as a cast member of the famed (and brilliant) sitcom, "Family Ties." Marty visits his friend's house, the scientist "Doc" Brown (Christopher Lloyd), blows up a giant guitar amp, and gets a life-changing phone call. "Don't forget now. Twin Pines Mall. 1:15 AM," Doc says. From there, Marty is taken on a ride into the past of his family and his town. His father, George McFly (Crispin Glover), a weakling constantly under the thumb of the town bully, Biff Tannen (Thomas F. Wilson), has no power and just as little ambition. His mother, the former town beauty, Lorraine Baines McFly (Lea Thompson), now a bored alcoholic, bickers with Marty and his brothers and sisters as they sit watching TV at the dinner table. She "would never sit in a parked car with a boy" in her day. After a seriously dark sequence of events, Marty finds himself in a seriously souped-up DeLorean, running from Libyan terrorists, and ultimately flashing back to 1955, when his parents were exactly his age. What happens if we mess with destiny? That's the key idea behind the first film. The least complex, but most powerful, of the trilogy. Out of fuel for the "flux capacitor," the gizmo that makes time travel possible, Marty remembers, with the reluctant help of a boggled 1955 Doc, that a thunderstorm is soon going to devastate the town at an exact time on an exact date. "Great Scott!" Lightning will strike the famed clock tower on the town square. While they hatch their plan, Marty finds himself in contact with his teenaged father. A scene at the town diner plays out, which leads to a scene in which it's him that his mother falls in love with, which leads to a scene at a school dance that will change everything this town knows about its history. All for the better. It may have stopped there if it had not been such a success. Made for only $19 million dollars ($42 million today), it has made over $300 million since its release. In the second installment, filmed back-to-back with the third installment, and released, respectively, in 1989 and 1990, we pick up right where we left off. This time, the plot gets much more complicated, as all of those famous scenes mentioned in the previous paragraph are reinvented. Doc has been to the future, where it comes to light that Marty and Jennifer's future children get into some deep trouble and life hasn't been as good as Marty would've hoped. A book of sports statistics "Gray's Sports Almanac" is introduced to the mix. Old Biff steals the DeLorean, gives the book to his younger self, and changes Hill Valley for the worse. A series of high energy chases and set pieces leads to a major malfunction. Doc is blasted to the past, the Wild West of 1885. The third part of this saga is easily the weakest but still a blast. 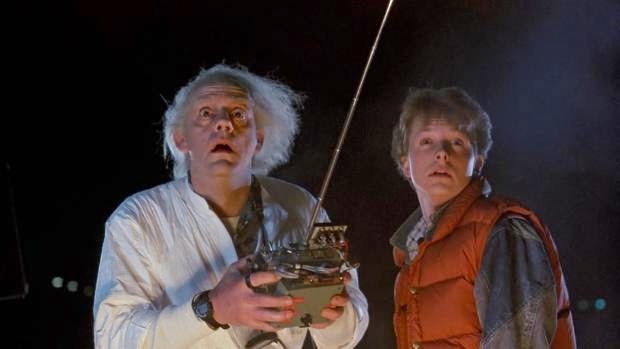 In a hilarious scene to end/begin Part II/Part III, Marty finds Doc, having just sent him "back to the future", now "back from the future," must find the DeLorean and destroy it after receiving word from 1985 Doc, stuck in 1885, to Mary, stuck in 1955. When it turns out a tragedy awaits back in 1885, Marty must travel to the old West, where Doc has created an enemy in Biff Tannen's ancestor, Buford "Mad Dog" Tannen, the outlaw (Thomas F. Wilson). A new subplot featuring a love interest for Doc in Clara Clayton (Mary Steenburgen) emerges. This one works for me as much as the second one. The second two films being true companion pieces. I've done the best I can and not even touched the brilliance behind this plot. It is massive, and everything connects. We are left with fun questions more than anything: Can we change our destiny? Should we? Is it wrong to boost yourself from the past into the future? What effects can that have on a town? Let's go back to the clock tower: it is everything. When Marty has to get back to 1985 in Part I, he runs the risk of losing his existence. If his parents don't kiss at the "Enchantment Under the Sea" dance in 1955, then he is never born, neither are his siblings. Everything must work out perfectly. 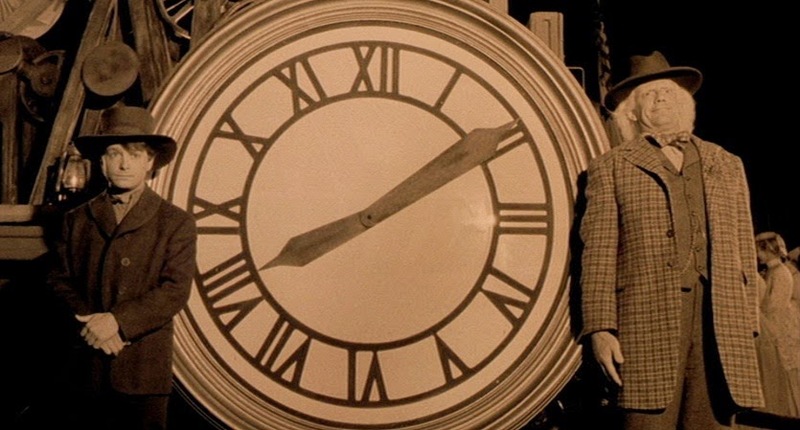 When Doc decides that the clock tower is the way to generate the electrical power for time travel, they effectively eliminate the need to save it in the future. The clock tower is saved, the McFlys are a better family, wealthier, fitter, happier. 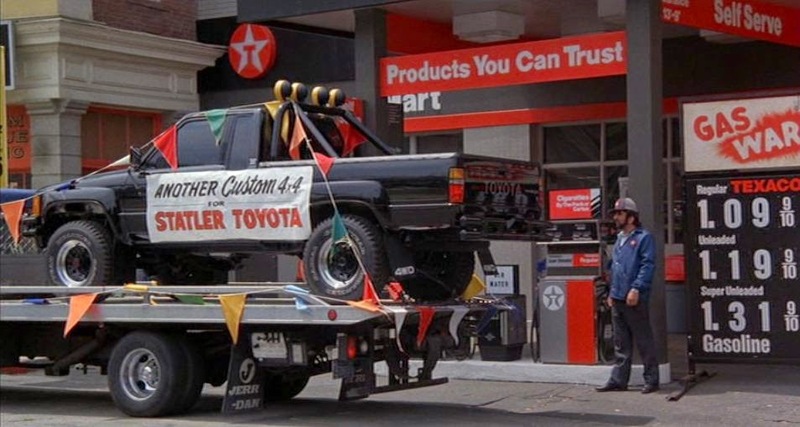 Marty even has his custom Toyota 4x4. 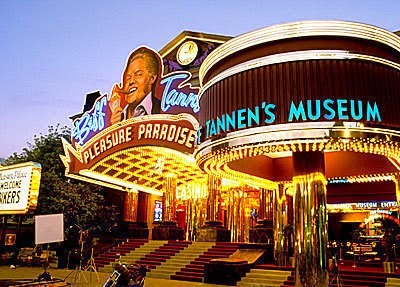 When Marty loses that sports almanac in 2015 in Part II, the clock tower becomes Biff Tannen's Pleasure Palace Hotel and Casino in an alternate, scary, dark Hill Valley. If good people make changes, things are good. If evil bullies make changes, things are bad. The book is recovered, future history is restored. 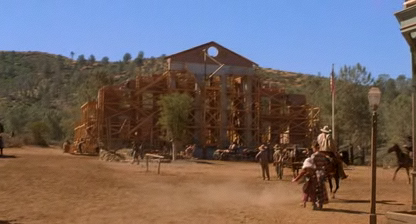 When Marty travels back to 1885 in Part III, the clock tower is just being built. Marty meets his ancestors, the first generation of McFlys. You'll notice how the length of the last three paragraphs speak to the thematic importance and weight of each subsequent installment. The second two films serve simply to flip all of the Hollywood ending perfection on its head and go into time travel hypotheticals. This is the reason the first film is so much better than the sequels. The first one meant something. It had a true end. The third one does wrap everything else up nicely where the second one fixes the future McFlys but not Marty. With each, the story whittles itself down actually to a story about Marty and Doc, instead of a story about a town and its relation to time. The first one just does everything better. The sequels simply reinvent the same scenes to illustrate how time and destiny are completely intertwined. To paraphrase season five of ABC's "LOST": what happened happened and will always happen and has always happened. It doesn't matter that the first is the best because all of these films are charming and fun as hell. They double back, triple back, quadruple back. Scenes are mirrored in each film. 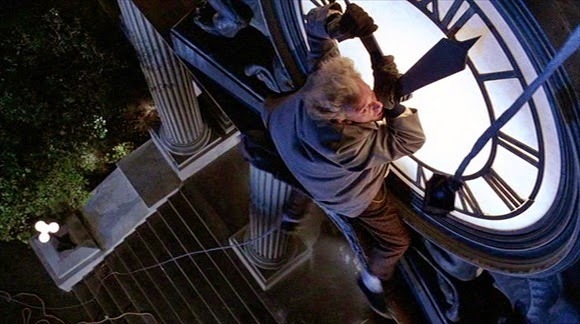 Most notably (apart from the clock tower as a motif), a scene repeated in each film where Marty gets knocked unconscious only to be awakened and nurtured by his mother, or great-great-great grandmother in the case of Part III. This is just the tip of the iceberg. There are things about this film, holes in plot, that will never be solved by anybody. They aren't meant to be solved. They're meant to be enjoyed. They are meant to be remembered. Created by visionary special effects pioneer, Robert Zemeckis, these films are visually iconic. The DeLorean itself is a statement about the 1980s before the 1980s were even over. Like the clock tower, the DeLorean represents something culturally important to all of us. All Americans know hometown squares and courthouses just as we all know the DeLorean. The downtown diner, then "Cafe 80s", then the town saloon, these all represent another aspect of the geography of main streets and memories of hometowns. For me, these movies get better with age. The flashes of light when the DeLorean hits 88 MPH, the shots of the clock tower, the chases around the square, the diner/cafe scenes, these are all shot to look the same but, in each time period, are shot just a little differently (see screen caps above). This is planned. It is great. The score by Alan Silvestri is as noticeable and classic as any of the great blockbuster scores by John Williams a la "Jaws", "Star Wars", and "Indiana Jones." The supporting performances, across the decades with the aid of heavy makeup, from Lea Thompson, Thomas F. Wilson, Crispin Glover, and Christopher Lloyd are equally as visually compelling as they are fun and, even silly. This movie gets away with being totally full of campy dialogue and hammed up performances while also having something intelligent to say and something emotional to grasp onto in saving a town, a life, a family for the better. 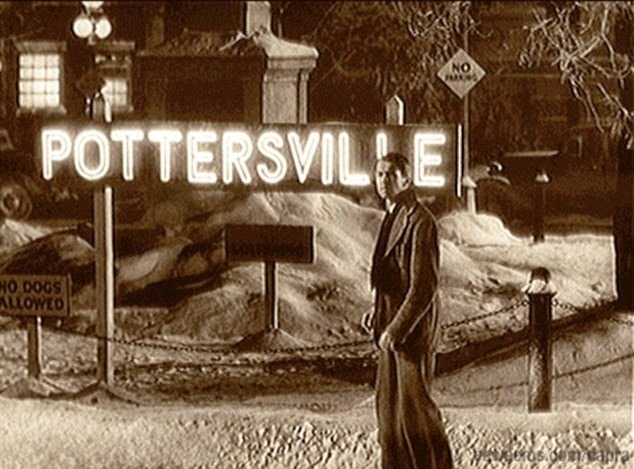 For my January Blind Spot this year, I watched Frank Capra's "It's a Wonderful Life," another story of a man and his hometown over many decades. There are connections here. There's a scene in the original "Back to the Future" where Marty makes it back to Hill Valley, 1985. He looks around and screams in happiness at all he sees, all he loves. He is home, gone from his own reality for no time at all, yet everything has changed for him. 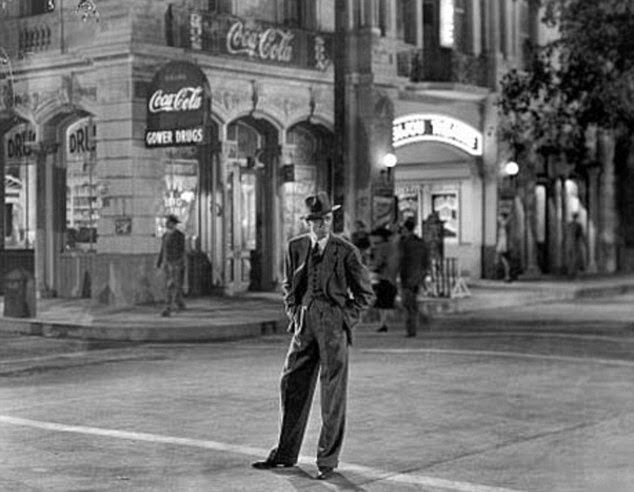 Robert Zemeckis and screenwriter Bob Gale have seen "It's a Wonderful Life." That is for sure. 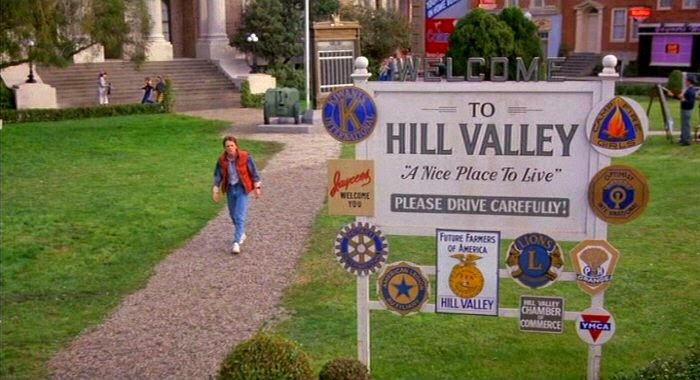 And Hill Valley is another movie hometown that might as well be our own. You really dove into these. Love it. I think Part II is the most underappreciated of these. I agree that it is better than Part III, by a mile, actually, but I've seen lots of places that have it as the worst of the three. I'm baffled by this. Thanks for enlightening me on the geographical aspects of this trilogy. I've seen a few times myself, but never thought of it quite that way. Fun fact: my daughter who is 12 has been on a Back to the Future kick lately and has watched the trilogy twice in the last few weeks. As a kid, I was way more into Part II. As an adult, it is clear that the sequels are just not as serious or meaningful. Still, they're so much fun. The third one is definitely the easiest to throw away, except for its connection to Part II. This geography thing is just an idea I heard. I ran with it as it made sense to me. So great that your daughter is into it. That's about the age I found it, and I was hooked for life. Really enjoyed reading your in depth look at the trio. The first one is without question the best, it has so many strengths aside from the brilliant work by Fox and Lloyd. Although there was only so many ways to fit them into the story I've always felt the diminished roles of Marty's parents, particularly Lea Thompson who is really quite wonderful in the first, was a waste of a resource. The films do skillfully trade on the history of each other to form a harmonious whole and while I don't hate it I can't agree that the second is stronger than the third. The second seemed like a junction which couldn't stand on its own while the third could easily. I will admit that the second is the one I revisit the least frequently so my memory of it is hazier and I might not be remembering it as clearly as the others. I like the corollaries you drew to Wonderful Life. I can't say I've ever noticed them before but it's so apparent when pointed out. Good catch. Thanks so much for taking the time to read this, Joel. I appreciate you and your comments. I agree that the second two films diminished the brilliance of Lea Thompson's work and pretty much totally removed Crispin Glover, who I find to be one of the most interesting character actors of my lifetime. I think my love for the second part comes from just how entertaining it was for me as a kid. It didn't make a lick of sense to me at the time, and in the grand scheme of the whole trilogy, but I just had so much fun watching it. I've never been able to let that love go. 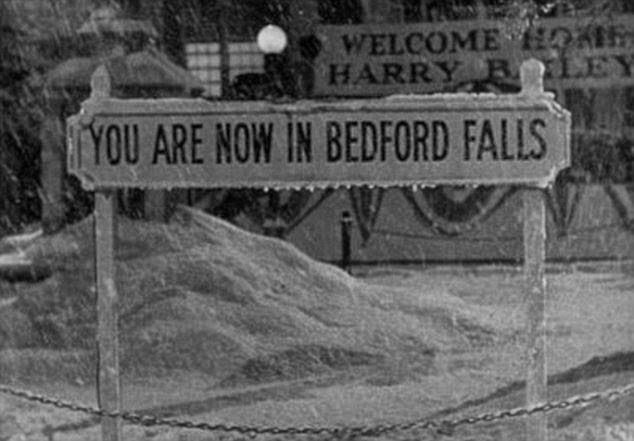 I think the It's a Wonderful Life connections came because I had so recently seen that movie. But it is almost uncanny how they tie together in certain ways.